There are three separate effective date fields in TariffShark. Two of these are stored in the database and the other is calculated (or derived) by the TariffShark software for display. This article describes each of these effective dates in detail. The Proposed Effective Date is the one you enter when you place a Tariff Record Version into a Filing. This is the date that is sent to FERC in the XML. This date is stored in TariffShark as a Filed Tariff Record Version (FTRV) data element. The FERC Effective Date is the one approved by FERC. This information is often included in a FERC order. However, it can also be inferred depending on the FERC program (gas, oil, electric) and the circumstances surrounding the filing (for example, oil tariffs typically go into effect 30 days after filing without the issuance of a FERC order). This date is stored in TariffShark as an FTRV data element. The Effective Date, which appears in several grids in TariffShark, is a computed date. 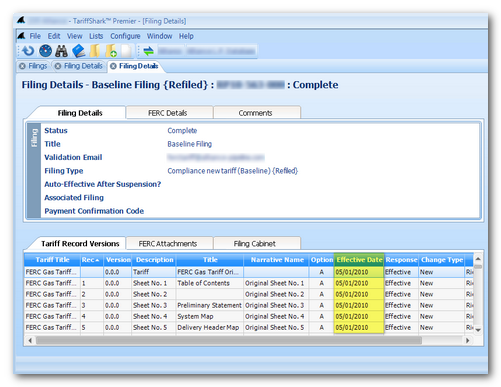 This date is perhaps most frequently seen in the Tariff Record Versions grid on the Filing Details screen (shown highlighted below). If the FERC Response of the FTRV is Approved Subject to Conditions, Pending, Rejected, Draft, Overtaken by Events, Pro Forma Ordered, or Withdrawn, the Proposed Effective Date is used. If the FERC Response of the FTRV is Approved, Effective, Suspended, or Retired, the FERC Effective Date is used. If the FERC Effective Date is empty, however, the Proposed Effective Date is used. If the FERC Response of the FTRV is Pending, Rejected, Draft, Overtaken by Events, Pro Forma Ordered, or Withdrawn, the Proposed Effective Date is used. If the FERC Response of the FTRV is Approved, Approved Subject to Conditions, Effective, Suspended, or Retired, the FERC Effective Date is used. If the FERC Effective Date is empty, however, the Proposed Effective Date is used. If you would like to know more about effective dates in TariffShark or if you have any other questions, please comment below or contact TariffShark Support.